Show your pet some TLC with an OrthoComfort Deep Dish Cuddler from Best Friends by Sheri! Measuring 20” long, 20” wide and high 9” tall, it can easily accommodate animals up to 25lbs and provides the sense of security they need in order to sleep deeply. Dogs, cats and even rabbits will enjoy the self-warming Sherpa, mimicking the comfort of a mother’s fur while promoting better sleep, health and behavior. DESIGNED FOR CONVENIENCE: Quick and easy to clean, pet owners will love that our dog mattresses feature a WATERPROOF bottom! Not only does this protect floors, but because these beds are machine washable and dryer-safe, excess hair and odors are a problem of the past. 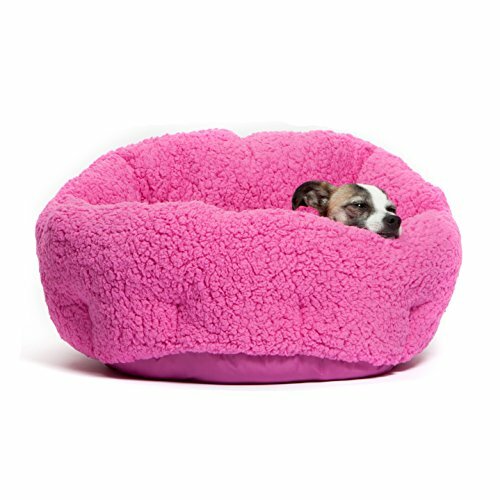 PREMIUM QUALITY: Made with only pet-safe materials, you'll rest assured knowing our puppy beds are completely non-toxic! Stuffed with virgin AirLOFT fibers, it keeps its loft for up to 3 times longer than the second-hand fibers found in most other pet beds. Festnight Elevated Cooling Dog Bed Cot with Canopy Shade 24"